Submitted photo Pictured are the 2017 Miss Junior Beavercreek Isabella Lacey, 2018 Miss Junior Beavercreek Emily Kuchera, Miss Beavercreek 2018 Elianna Cade and the 2017 Miss Beavercreek Callista Hess. 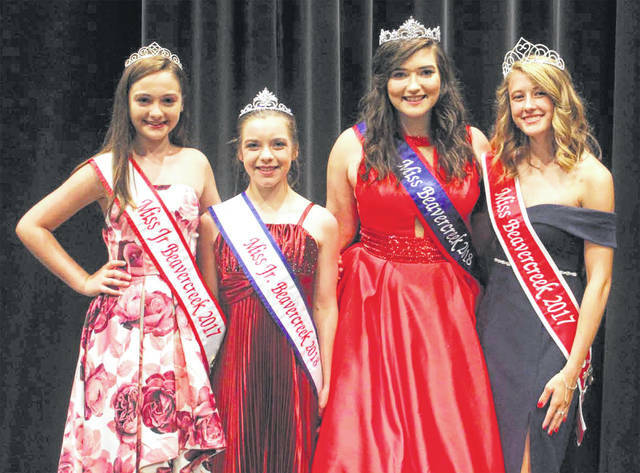 BEAVERCREEK — Elianna Cade was selected Miss Beavercreek and Emily Kuchera was named Miss Junior Beavercreek at the Miss Beavercreek Civic Pageant June 8 at Beavercreek High School. The purpose of this citizenship pageant is to select young women who represent the spirit of the Beavercreek community. The pageant is not based on appearance and pageant organizers take pride on the long list of winners that have represented not only the city in a confident and upstanding fashion. Cade is a senior at Beavercreek High School. She competes on the varsity women’s lacrosse team and the varsity academic challenge team. Her many other activities include the Pre-Medical Club, French Club, Interact Club, Student Council and Civil Air Patrol. She enjoys volunteering and visiting patients at Soin Hospital and giving tours at Carillon Historical Park. Kuchera is a seventh grade student at the Ankeny Middle School. She is actively participates in the Beavercreek Taekwondo group, Legend’s Select Fastpitch and the Beavercreek Fastpitch Association. Kuchera is a member of the Beavercreek Youth Council where she volunteers for the community. https://www.beavercreeknewscurrent.com/wp-content/uploads/sites/49/2018/06/web1_MissBCreek.jpgSubmitted photo Pictured are the 2017 Miss Junior Beavercreek Isabella Lacey, 2018 Miss Junior Beavercreek Emily Kuchera, Miss Beavercreek 2018 Elianna Cade and the 2017 Miss Beavercreek Callista Hess.